A female river otter was recently transplanted to Utah’s Provo River. She arrived amongst great controversy from the fly-fishing community; a population that for the most part extols the virtues of wildlife. As more are released and they establish themselves within the fisheries riparian corridor, their impact will be closely monitored by all interested parties: biologists, anglers and other recreational users of the Provo River system. Only time will tell of their place and impact. Across this country otters have been in a state of decline for a century. When the fur trade was at its peak in the late 1800’s and early 1900’s their desirable pelts led to the decimation of their population, as did any mammal with marketable qualities. Since then loss of habitat and pollution have continued to impact their numbers. In the 1970’s wildlife management agencies across the country implemented strategies to protect and mitigate habitats that were critical to these mammals. Reintroducing otters into healthy habitats where population had become critical or absent became an integral part of this process; a strategy that has been successful and well documented here in Utah. 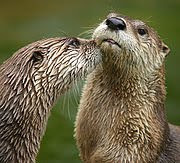 In 1989 otters were relocated to Utah’s Green River. When anglers, guides, outfitters and local businesses learned of this, much criticism and concern followed. It was felt that the impact these animals would have on the trout population would detrimentally affect the fishery and in turn those whose livelihoods were dependent on this fishery. Two decades have passed since the first otters were introduced and their presence has benefited these waters in a number of ways, yet many in the angling community remain concerned and vocal about their presence. As long as they are free to cohabitate here and on other waters with similar attributes a certain level of narrow minded apprehension will exist. At the root of the controversy lies an otter’s diet. On average an adult otter consumes 2-3 pounds of fish a day. With the Green and Provo River being several of the countries more prolific fisheries, anglers have thoughtlessly taken notice. Otters do eat trout, but given the option they prefer other more palatable species: carp, chubs or whitefish. They also have a liking for crawfish, a crustacean that is prolific in Deer Creek Reservoir, as are carp. It is known that a predator based ecosystem leads to a more vigorous and stable ecosystem. In referencing this in a recent conversation, an acquaintance raised concerns about otters not having a predator base. On the Provo River, this is what I came up with: dogs, coyotes, bobcats, mountain lions, and eagles. I’d say that’s a fair number. Add one more noxious predator, two-leggeds. While putting the finishing touches to this piece, I learned that the otter mentioned in the opening paragraph has already died. An errant surgical complication led to her death. To those dedicated to this project and others who see the value in it, the news was devastating, especially since she was pregnant. To many in the angling community, they couldn’t be more delighted. I fish because it puts me in places of beauty; liquid corridors resplendent in life, removed from the pandemonium of city life. Although fishing often is the vehicle that transports me amongst such panoramic splendor, it’s the entire range of the experience that makes the activity so rewarding. To fish a watershed void of wildlife would be nothing short of a sterile experience. I’m more than willing to catch fewer fish, to accommodate these otters and other species whose existence and ensuing impacts may result in more resilient habitats. Playing court jester to suit our own avaricious motivations, since we fish for sport and not necessity, seems rather maligned although not surprising. Several years removed, in the predawn hours, a friend and I walked the banks of a river long before anyone else had yet to arrive. 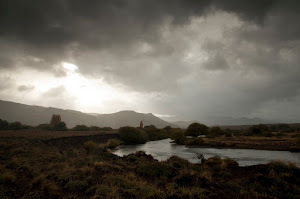 Our early jaunt had nothing to do with fishing, but to experience a river as it awoke, hoping to find its corridor yet undisturbed. For a mile we traveled a path long worn by others before entering the rivers current to cross. Downstream, in the distance a placid pools stillness suddenly erupted into life. Perplexed we stood vigil until we identified the cause of the disturbance, otters. Having fished these waters for over 30 years, it was the first time I had seen them. In our still act of vigilance, they frolicked close enough for us to here their barks, elevated in protest at our presence before silently slipping beneath the rivers waters, deceptively disappearing. The significance of this encounter erased all else that took place that day. We probably caught a fish or two, but that isn't what either of us remembered. To fish waters where habitats provide the opportunity to witness a spectrum of wildlife heightens the overall experience. Although, trout play a vital role in the affair they are only part of the ecological equation. All others play an equally vital role in the ecological balance of those resources we derive sport from. In the grand scheme of things it is us who are the intruders, and not those who now seek refuge within this biologically diverse resource; a resource where the otters will have an impact, as do we as well.